At Community of Peace Academy Middle School, students are prepared to become principled and ethical learners and community members, equipped with the knowledge and skills needed to succeed in a college-preparatory high school environment. Our middle grades program is a small and supportive school environment for 7th and 8th grade students, highly responsive to the unique developmental needs of early adolescents. The learning program encourages active and personalized learning, and promotes the development of self-advocacy and academic responsibility. 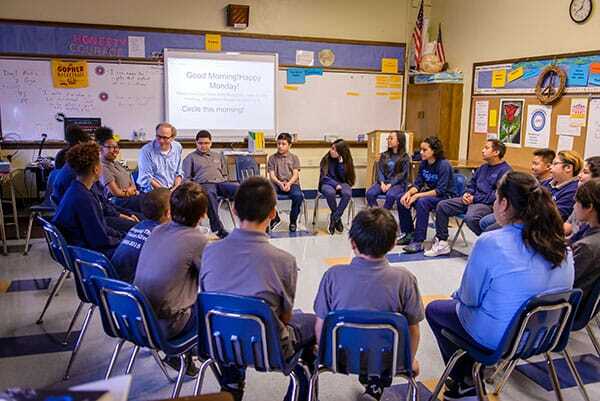 An advisory teacher serves as a mentor, ensuring that each student has a personal connection with a caring adult, and serving as a point-person for parent dialogue and partnership.